A paixão pelo mundo equestre, o cavalo como constelação , as pessoas como estrelas desse universo. From the earliest written myths, horses have frequently appeared in literature. They appear as main characters, sidekicks and symbols of overarching themes. Horses are commonly used in children's literature as children usually relate well to animals, but authors of adult books write about horses as well. In J.R.R. Tolkien's The Lord of the Rings, Legolas' horse, Arod, figures prominently. He serves as a vehicle to demonstrate Legolas' power, as Legolas can ride this fiery horse without a saddle or rein. By contrast, Gimli was not comfortable on Arod. Miguel de Cervantes , the author of Don Quixote, uses horses to symbolize movement, as well as to define a character's class. The noblemen ride sitting in carriages, Don Quixote and the robbers ride on horseback and the pilgrims have to walk to the city. In addition, whenever Don Quixote sees horses in the distance, he anticipates a new adventure. Horses are also important as companions in the travels of Don Quixote and Sancho. The Pippi Longstocking series by Astrid Lindgren uses Pippi's horse as a companion and a means of demonstrating Pippi's unusual qualities. She regularly lifts the horse onto her porch and is unfazed by the horse's presence in her kitchen. The horse grants her freedom; she can ride the horse to any destination she pleases. Bevis of Hampton, a Middle English romance, features Arondel, a horse belonging to Bevis. All the main characters in this romance attempt to obtain Arondel to gain prestige from owning this special horse. Bevis treats the horse as a feudal subject rather than a possession that can be transferred. Their relationship demonstrates loyalty and deep communication between species. Barnum and Skip, the Wilders' team of driving horses in the Little House series of books by Laura Ingalls Wilder, serve as a symbol of the Wilders' journey. As they move west across the prairie, their loyal horses have to brave difficult terrain and wild animals. Similarly, the American pioneers faced unknown dangers as they settled the prairie. A Winter's Tale by Mark Helprin, features a horse named Athansor that is ridden by Peter Lake. Athansor could leap high in the air and can fly when called upon to do so. When Hardesty and Virginia were about to die in icy water, Athansor saved them. This white horse appears to be an angel. Before the end of the book, Peter has to release him to go to heaven, and Athansor's hoofbeats make the entire Manhattan island shake as he lifts off to heaven. 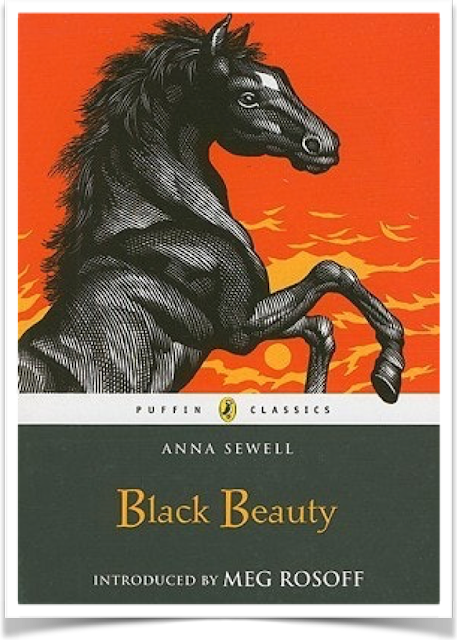 Black Beauty, a novel by Anna Sewell, features a horse as its main character. Unlike most horse stories, this book is written from the perspective of the horse itself, as an autobiography. By giving the horse human traits, Sewell hoped to arouse the public's concern for horses, promoting their humane treatment. She succeeded as the book resulted in legislation to protect horses. Walter Farley wrote a series of 21 books about a horse, beginning with The Black Stallion in 1941. The protagonist, Alec, develops a relationship with the horse on board a ship. Although everyone else on board fears the dangerous horse, Alec pities the stallion and treats it kindly. A main theme of the book, Alec's maturation, is revealed through his interactions with the black stallion. Misty of Chincoteague was a real pony written about by Marguerite Henry in a book of the same name. This classic book in the genre of realistic fiction won a Newberry Medal, a prestigious children's book award. The book describes the adventures of two children who work hard to buy a wild horse and bring it to their home. At the end of the book, they struggle with the decision to set the horse free again. The Horse Whisperer by Nicholas Evans tells about a man with an exceptional ability to communicate with horses. After a severe horse-riding accident, he helps the horse, Pilgrim, and the rider, a teenage girl named Grace, overcome their trauma. In the book, the horse's relationship with its owner is so strong that their healing is linked. Clearly, horses appear large in writers' and readers' imaginations. Including them in a book's plot to illustrate a theme or draw in animal-loving readers is a successful tactic for writers.